View More In Fiber Optic Transceivers. TRENDnet’s TFC-1000MSC, Intelligent Fiber Converter, is compatible with the TFC-1600 chassis system or functions as a standalone unit. This converter is a Multi-Mode SC-Type fiber converter that supports SNMP (when used TFC-1600MM) and spans distances up to 550 m (1,800 ft.). 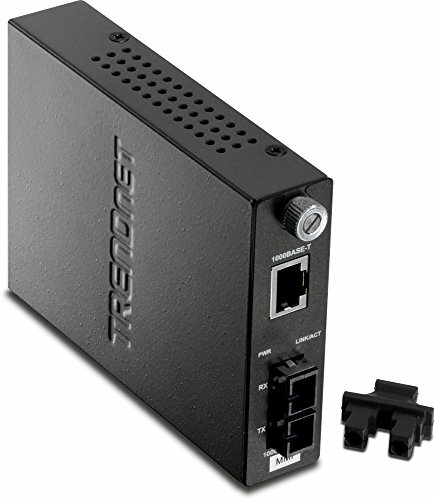 Ports include a 1000Base-T (RJ-45) port and a 1000Base-SX (SC-Type) fiber port. If you have any questions about this product by TRENDnet, contact us by completing and submitting the form below. If you are looking for a specif part number, please include it with your message.